"...the fruit is like a medlar; it is first green, then yellow and red when it is ripe: if it is not ripe, it will drive a man's mouth awrie with much torment, but when it is ripe, it is as delicious as the apricot." Despite tasting amazing and being disease resistant, you will find few areas that grow American Persimmons on any large scale. This is because almost all the commercial development and breeding has been concentrated on oriental persimmons (Diospyros kaki), which have been bred in Asia for close to 2,000 years to have fewer seeds and larger and sweeter fruits. 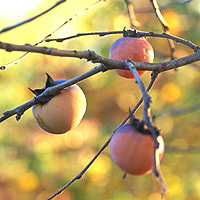 Most of the native persimmon trees growing today are actually wild, and they have an extensive natural range that stretches from Florida in the south, the very southern tip of Connecticut in the north, and Texas in the West. Just like apples and many other fruits spread from seeds, some of these wild cultivars are tasty while other you should skip. But growers have domesticated several tasty varieties from the wild which you can get through nurseries. They're generally smaller than oriental persimmons. Some are the size of cherry tomatoes while others are just slightly smaller than an oriental. The wild ones tend toward having more seeds, but the domesticated varieties have less. Often, raw foodists complain that the best fruits grow in the tropics, but they forget there's quite an tasty selection that you can only grow, or grow best, in the far north. Where native Persimmons really shine, and where their greatest potential as a fruit species lies, is in their ability to go where no oriental persimmon can. While oriental persimmons cannot withstand temperatures below 10º F, native Persimmons have no problem in up to -20º F. This gives them a range that extends northward as far as the southern parts of Canada. In the video below, you can see an abundant crop growing in frigid Michigan. 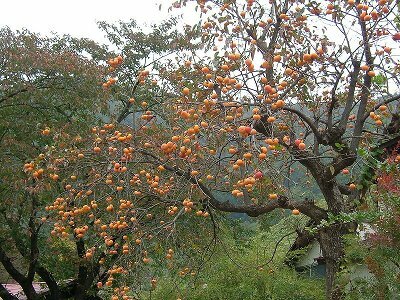 Learn how to integrate the American persimmon into a healthy raw food diet. Find out about some other fantastic fruit species.